An expert in boating gave his Catamaran Review of the Lagoon-39, and his overall perception of the vessel was highly active. Although Herb McCormick is not the only one to feel so strongly about this innovative catamaran, his opinion is precious in the yacht world. The bows were slicing through the waves with surprising buoyancy. The bridge deck seemed almost unphased in spite of the waves. Where most forty foot catamarans would be tossed about, the Lagoon 39 stayed steady, and McCormick was able to stand there without getting wet. Walking to the aft, he found something else to get excited about besides the Lagoon-39’s stability on rough waters; the boat was making its way at sea somewhere between a speed of 6.1 and 6.4 knots. This is incredible considering the wind on that day was ranging in speeds between 18 to 22 knots. This catamaran with a square-topped main with the solitary reef in and a self-tacking jib. It was taking on winds that similar sized yachts could never contend with. When he neared a close reach, the speedometer began climbing to 7 knots and got up to 7.5 knots as he came closer to a beam reach. One might expect the changes in wind forcing such variation on the sail trim and heading to cause the sail to be jerky and inconsistent. Even when the wind started hitting the aft quarter and ship got to 8 knots, the vessel still sailed along smoothly as ever. In his Catamaran Review McCormick also noted how impressed he was with the Lagoon-39’s submerged parts as well. He has been a fan of the owner of the vessel being able to live like a king as the entire starboard hull is reserved as a master suite. This layout where there is a room dedicated to the captain of the ship gives himself and passengers privacy by sectioning his bedroom off from a stateroom which can be closed just by shutting the sliding door. The central saloon on the other side of the door has a king-size double berth aft, a sizeable en suite head, a midship vanity/desk and another private shower stall forward. The designers of the Lagoon-39 ran with this idea and added a few touches. The stateroom and port hull are identical to the starboard cabin. Though this approach to design may seem far from complicated, it is innovative nonetheless. This layout represents the way most catamaran owners would love to use their boats, but most catamaran manufacturers do not offer it. 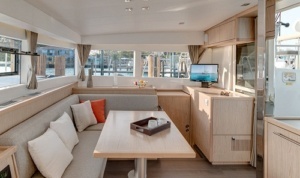 For buyers that want the traditional three and four cabin layout, the makers of the Lagoon-39 do offer plans that will suit their taste as well. The average starting price for this unique catamaran is four hundred thousand dollars, but it can be upwards of six hundred thousand dollars depending on the layout and features the buyer requests. McCormick noted in his Catamaran Review of the Lagoon-39 that the entire yacht had true innovation and appeal. He was happy to see the double spreader fractional rig was positioned farther aft than on most catamarans. The Lagoon-39 can maximize pitching and power because of this. He was also impressed by the tips of the catamaran’s identical mini-keels that enable better lateral resistance and stability. Other small things came together to make the Lagoon-39 so special. The oversized cockpit, the elevated helm station, and the centrally-located sail controls stood out to him and many other yacht enthusiasts as well. He was very impressed with the main saloon. The upscale forward facing navigation system, a thoughtfully laid-out galley, and a large dining table would certainly please anyone who spends their time on the water. Expert boaters were quick to notice quite a few similarities between the Lagoon-39 and the 400S2. There’s a few similarities and differences worth mentioning. 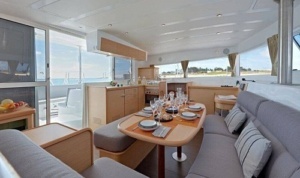 At first glance, the saloon of the Lagoon-39 and the 400S2 look almost identical. The Lagoon 39’s saloon is slightly more narrow in the beam than the older version. Even though it is a little bit smaller, it is by no means tiny. Six passengers can sit at the U-shaped dinette while another six guests can be seated around the cockpit table. The galley is set up, so the bench top with two matching sinks is positioned next to a sliding window that opens to the cockpit. A front-opening refrigerator sits securely on the bench, and the top opening freezer is on the other side of the cockpit-saloon hallway. Upper and lower cupboards are secured in the galley along with a three burner stove top/grill and a microwave station with seven 240 Volt outlets. Every flat surface has fiddles, and there are grab handles to make life in the kitchen more feasible. The dinette is innovatively designed with a sliding/folding chair at the end. So that it can also be used as a chart/table chair. When the seat is open, it reveals an electric control panel. The battery controls are located in a cupboard inside the captain’s cabin. A sliding aluminum and glass door separates the cockpit from the saloon. Passengers can open the sliding salon window and door for a very open layout joining the saloon and cockpit. Since weather can always be a factor at sea, both can be shut, and a sump and teak grate at the door can prohibit water from entering the comfortable saloon. Getting on the Lagoon-39 is simpler during a starboard berthing since a fold-up swim ladder blocks a portion of the port hull. Other boarding options include a set of gunwale gates and a fastening boarding ladder that also come with the boat.